The tram network changed on Monday 14 August when HSL’s transport services switched to winter timetables. The circular routes (2, 3, 7A and 7B) were replaced by straight routes. NB! To open a more detailed PDF version of a route map, click on the map. The route changed and the tram started to run every day. 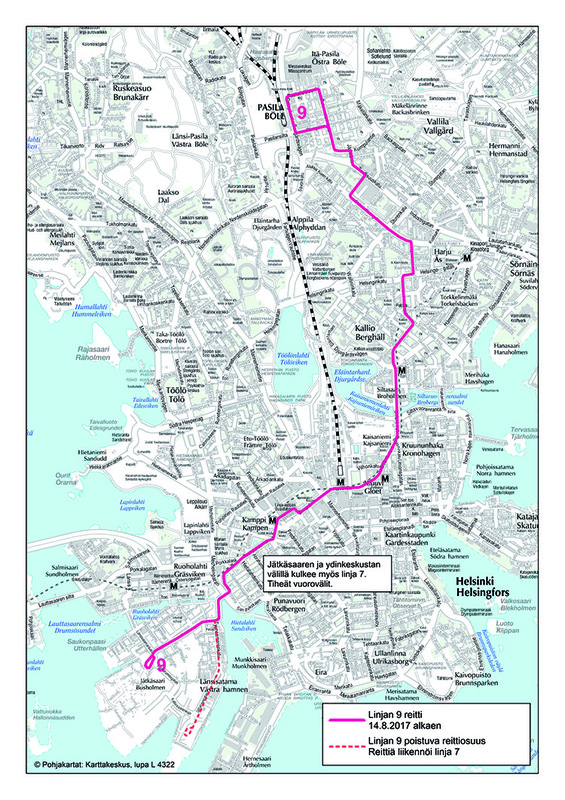 The route is: Eira – Fredrikinkatu – Bulevardi – Lasipalatsi – Runeberginkatu – Helsinginkatu – Sörnäinen – Mäkelänkatu – Käpylä. The tram runs every 10 minutes Monday to Friday and Saturdays, on Sundays every 12 minutes. 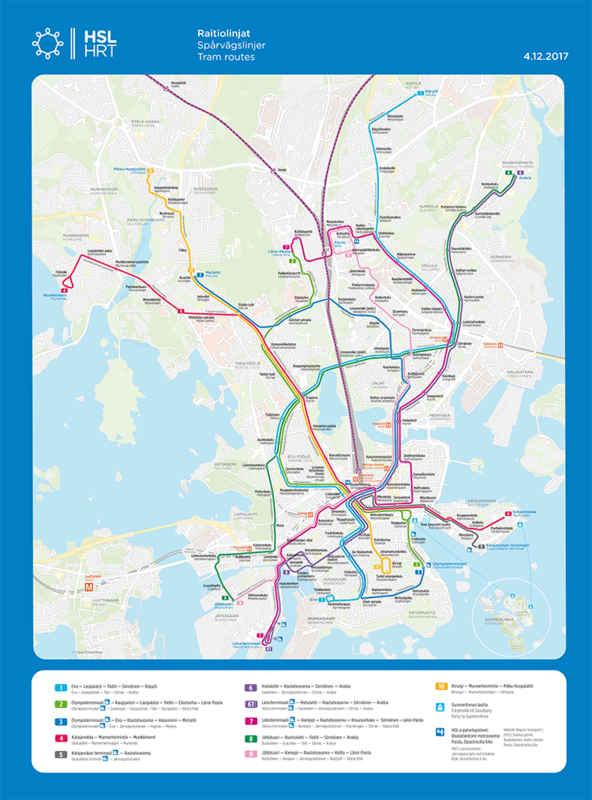 The route chanced in Etu-Töölö and city center. 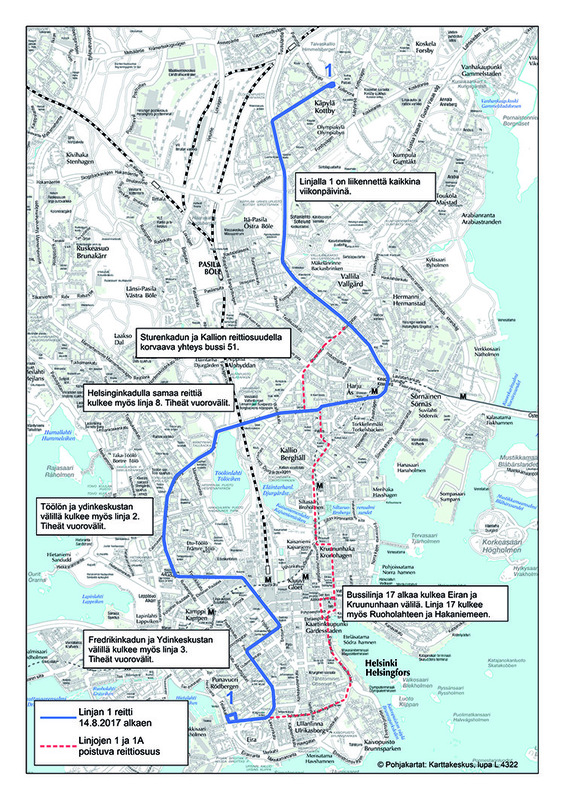 The route goes via Aleksanterinkatu, Mannerheimintie and Arkadiankatu. The tram will no longer run to Kamppi, but tram 7 will replace the service. The northern terminus moved to Länsi-Pasila. There were no changes to the headways and operating hours. The northern terminus was moved to the junction of Mannerheimintie and Kuusitie in autumn 2017 when the new tracks on Reijolankatu were completed. There were no changes to the headways and operating hours. No changes to the route. On route 6, headways were lengthened to 10 minutes. Consequently, the tram has the same headways as tram 7 and the two trams run along Hämeentie every 5-6 minutes between Sörnäinen and Hakaniemi. In Arabia, the combined service frequency of the trams 6 and 8 will be 5-6 minutes. There were no changes to route 6T. Trams 7A and 7B were withdrawn. A tram route 7 started to run from the West Terminal via Pasila station, Mäkelänkatu, Sörnäinen, Hakaniemi, Kruununhaka, Central Railway Station and Kamppi to West Terminal. Tram 2 started to run from Töölö to Länsi-Pasila. On route 8, headways lengthened to 10 minutes during peak hours. The tram has the same headways as trams 1 and 6 and on the joint section of route between Töölö and Sörnäinen, the trams operate a more frequent service, running every 5-6 minutes. Tram routes 6 and 8 operate with the same headways between Sörnäinen and Arabia. The southern terminus of the route was moved from the West Terminal to Saukonpaasi. The tram started to run along Välimerenkatu. 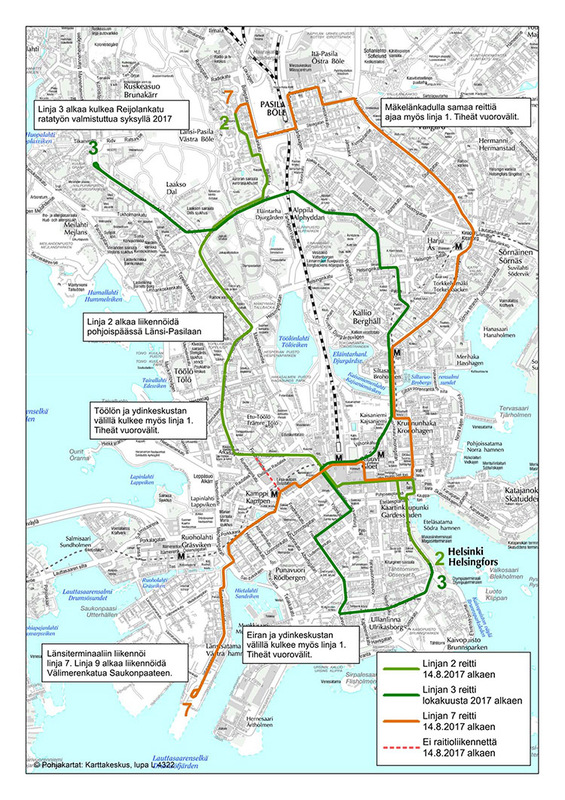 The changes will help to create a more robust tram network in central Helsinki, making travel between nodes easy thanks to frequent service. As two or more tram routes run along the main streets, headways on the joints sections of route are at the most 5-6 minutes depending on the day and time of day. Some of the routes enable passengers to easily cross the city and the aim has been that direct journeys would be possible mainly on the same routes as at present. The plan improves the cost-effectiveness of tram services, allowing the number of services to be increased. Services are increased primarily during the daytime and evening hours to make the use of trams on personal business and leisure journeys easier. The sufficiency of on peak capacity is ensured by new, bigger trams. 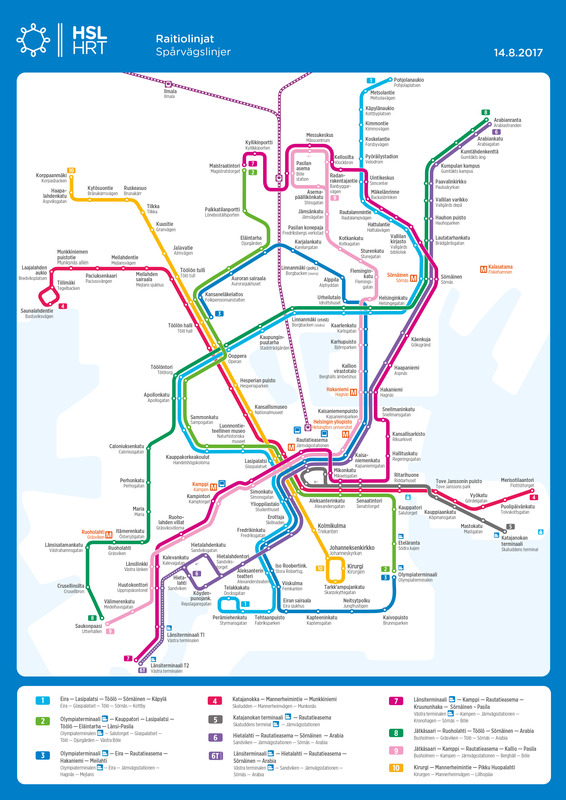 The Helsinki tram network has remained relatively unchanged since the 1980’s. It is necessary to adjust the network to better serve the changing city and society. As former harbor areas are being turned into residential and employment areas, the need for transport in the city center is growing. In addition, people’s travel habits and values are changing. 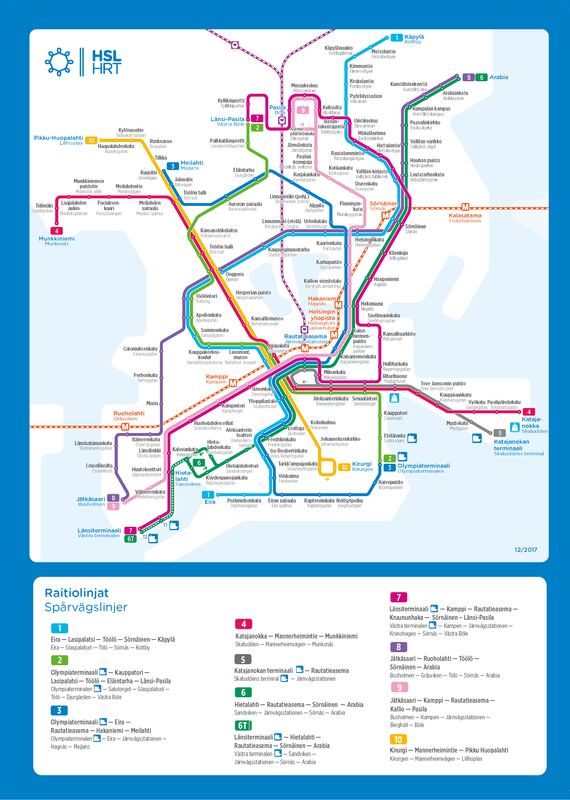 The Ring Rail Line and West Metro also affect travel patterns in central Helsinki in the coming years. New rail lines bring in passengers from a wider area, increasing passenger numbers also in the city center. Moreover, the population in the Helsinki region is projected to grow rapidly in the coming years. Tram passenger numbers are on the rise again. HSL wants to develop tram routes in order for the positive trend to continue and even get stronger. At the end of 2013, HSL held three resident meetings where residents could view draft tram network plans, discuss with transport planners from HSL, Helsinki City Planning Department and HKL’s Tram Unit, and to give feedback. Residents were able to view the route network plans in advance at the meeting places and they could give written feedback also before and after the meetings. The draft plan was available for comments in February 2014 at HSL’s web site as well as on a blog created for the plan and people were able to comment on the plan by email. The draft plan was presented to the Executive Board of HSL on 25 March 2014 and the Board decided to circulate it for comments to HSL member municipalities. The plan was completed on the basis of the statements and feedback received and the Executive Board of HSL approved the plan in February 2015.